Catholics and Muslims on the predominantly Hindu island of Bali adjusted their Friday religious services to respect the local Hindu celebration of Nyepi, or "Day of Silence." This year, Nyepi fell on March 7, a Friday. Balinese Hindus mark the day, the Balinese New Year according to the Cakaic calendar, with silence, fasting and meditation for 24 hours from 6:00 a.m. that day. The Cakaic calendar goes back to the arrival in 78 A.D. of Indian Prince Aji Caka, who established a Hindu kingdom on Java, the larger island west of Bali. During Nyepi, Balinese Hindus stay at home, refrain from working and avoid lighting fires or turning on lights. All offices, business centers, tourist resorts and even Ngurah Rai International Airport closed for 24 hours. 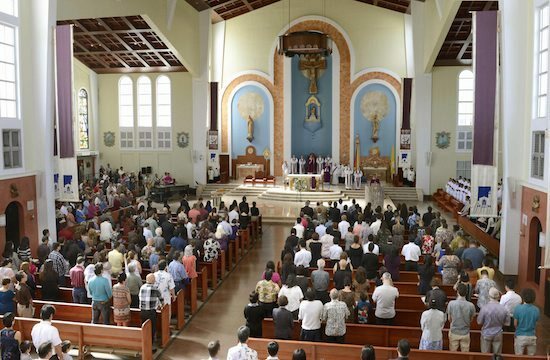 In respecting the Hindus´ holy day, all 17 Catholic parishes on Bali held their Way of the Cross services and First Friday Masses on Wednesday or Thursday that week instead of on Friday. Masses dedicated to the Sacred Heart of Jesus are traditionally celebrated on the first Friday of each month. Holy Trinity Parish in Tuka, a predominantly Catholic village, held their Way of the Cross service followed by First Friday Mass on Thursday. About 250 parishioners attended both services. The parish serves 450 Catholic families in several villages including Tuka, which has 120 Catholic families. The village also has 40 Hindu families, 15 Muslim families and 14 Protestant families. Divine Word Father Kristianus Ratu, the parish priest, told UCA News that during Nyepi, his church turned off all lights and held no religious services. 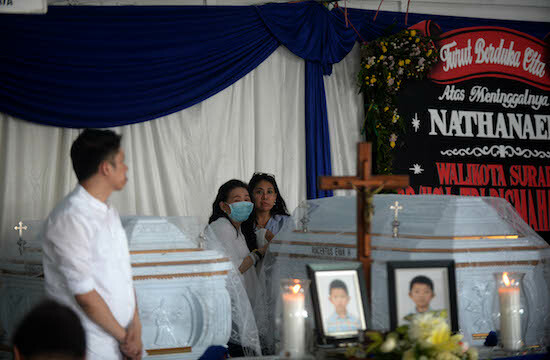 Divine Word Father Yosef Wora, Denpasar´s diocesan administrator, had issued a letter on Feb. 20 to all parish priests instructing them to hold Way of the Cross services on a day other than Nyepi. The diocese, based in the Bali provincial capital of Denpasar, about 970 kilometers southeast of Jakarta, covers Bali and several neighboring islands. Earlier, eight local leaders from Buddhist, Christian, Confucian, Hindu, Muslim and interreligious organizations issued a joint statement on Feb. 11 calling on people who are not Hindus to adjust their religious activities on Nyepi. 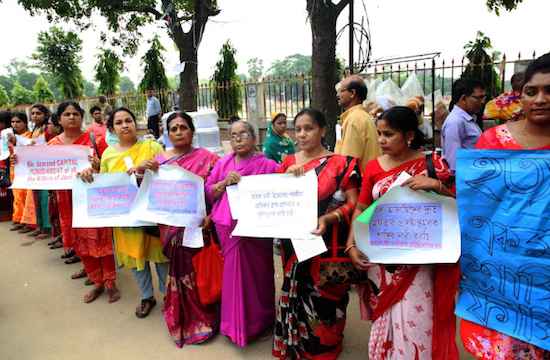 "The adjustment aims to respect local Hindus," said Father Wora, one of statement´s signatories. Speaking to UCA News on March 1, he suggested that Catholics could spend the day praying and reflecting on Jesus´ suffering at home. "We can see it as a family retreat," he said. Local Muslims made similar adjustments. Roichan Muchlis, chairperson of the Bali chapter of Majelis Ulama Indonesia, or Islamic Scholars Council of Indonesia, told UCA News that during Nyepi local Muslims attended Friday prayers at mosques, but the mosques did not use loudspeakers to amplify the prayers as they normally do. Muchlis, another signatory to the joint interreligious statement, also considered Nyepi a family day. "I can sit together and talk with my family members," he said. Ida Bagus G. Wiyana, a Hindu member of the local Communication Forum for Religious Harmony, explained the catur brata (four prohibitions) of Nyepi. These are amati geni, which means no light or fire, and hence no cooking; amati karya, or no work, only meditation; amati lelanguan, no pleasures; and amati lelungan, (no traveling). Wiyana, who also signed the Feb. 11 statement, clarified to UCA News on March 1 that Balinese Hindu leaders allow members of other religions to carry out their religious activities during Nyepi, because local Hindus realize they are not alone. "Although Hindus are the majority, the existence of other religious believers cannot be ignored. So to live harmoniously we should show tolerance and respect for one another," he said. Acknowledging that local Catholics and Muslims made adjustments to their Friday services, Wiyana added, "We Hindus very much appreciate that attitude, and we are very grateful." Bali has about 3.1 million people, 93.2 percent of whom are Hindus. Muslims, Protestants and Catholics respectively comprise 5.2, 1.05 and 0.47 percent of the population.